Skirt in picture will not appear as adorable and bubble shaped as is in real life. 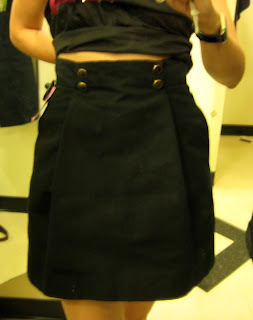 Black Chloe skirt for $179.99, was $1180. Size 6, fits like a 4 or a little less. Cute wooden/gold buttons! Minor zipper repair needed in back. Speaking of Chloe, this jacket is INCREDIBLE! I would be tempted to wear this as a dress. It's so great there are snaky security things all over it. And it's so great I was talking to it as I photoshopped this picture and my officemate asked me if I always talk to my clothes. Yes, when they are this fabulous, of course! Missing one button, but extra buttons are on the tag. Click on photo to see graceful neckline & rich fabric. 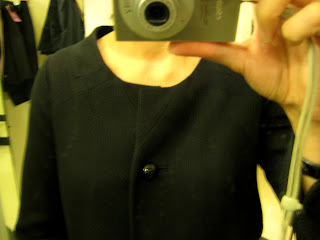 Black Chloe jacket, size 4, $298.99, was $2,695. Tapered, high-waisted Celine pants, size 4, $139.99, was $820. 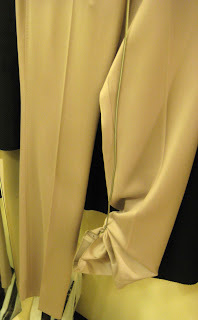 Lovely, beautiful shape, unfinished hem. 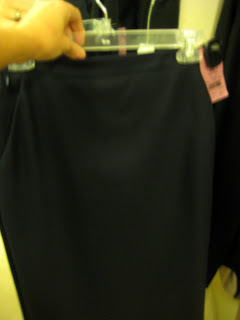 Size 2 Ferretti Philosophy navy pencil skirt, $89.99, was $345. Perfect basic. Go to the 6th floor register and pick up what you'd like from the Debbie hold. The store is open till 9pm. Please someone PLEASE go get that Chloe jacket. And tell her I miss her. Sob! I promise next week to post Debbie earlier in the day, sorry! ps - i need to go to this store next time im in ny. youre killing me with these finds! If he was into wearing skirts at all that is. Did anybody get the Chloe???? Debbie has a keen eye but if she had a pair of bolt cutters, she'd be singing! You do have a great fashion sense don't you! Love the skirt and the jacket. They are all great. Wow. That JACKET. Such a find! Debbie says thanks, she's out back right now sharpening her bolt cutters. The Chloe jacket is amazing, er, why don't I live in America?